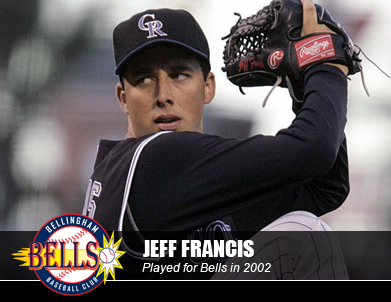 The best measure of the health of former Bells and current Rockies pitcher Jeff Francis' left shoulder isn't in how he is throwing. It's who is catching his throws. Former Bells outfielder and current Washington quarterback Jake Locker announced Monday he will return to Washington for his senior season, quickly putting to rest any lingering questions about his future. 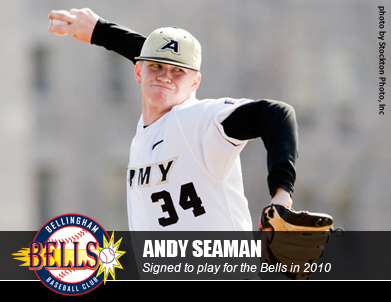 United States Military Academy pitcher Andy Seaman has signed a contract for the 2010 season to play with the Bellingham Bells of the West Coast League. 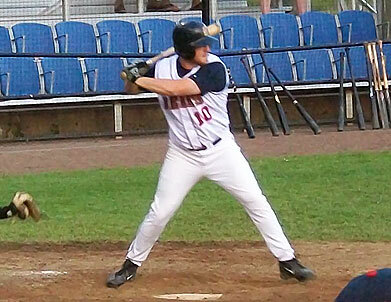 Seaman is the first player added to the 2010 roster and the first signing for first-year Bells manager Kevin Matthews. 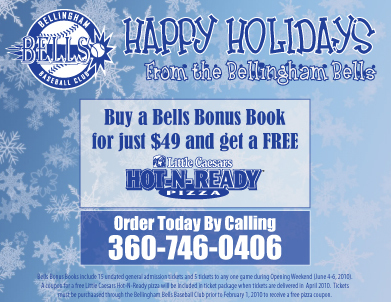 The Bellingham Bells Baseball Club and Little Caesars pizza have teamed up to offer fans a special holiday package. Through February 1, 2010, any fan that purchases a Bells Bonus Book for just $49 will receive a coupon for a free Little Caesars Hot-N-Ready Pizza. 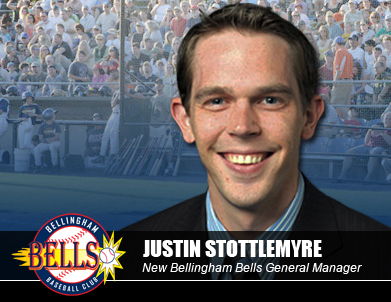 The Bellingham Bells have promoted Justin Stottlemyre to general manager effective immediately. Stottlemyre has been working as the Bells director of sales following a September promotion. He was originally hired in May by Brett Sports & Entertainment to serve as the Bells media coordinator. 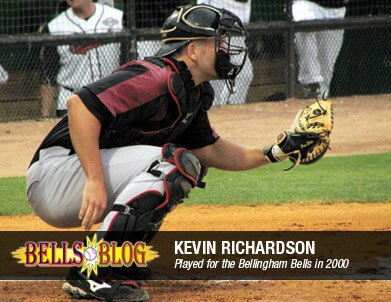 The Texas Rangers announced that the club has signed former Bellingham Bells catcher Kevin Richardson to a minor league contract with an invitation to major league spring training. 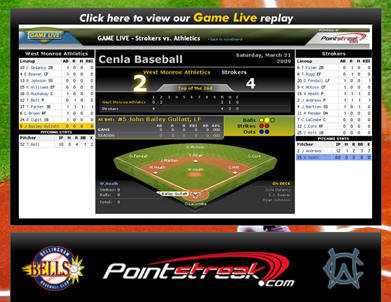 Pointstreak.com Inc. and the West Coast League are pleased to announce they have reached a long term agreement which will see Pointstreak provide real-time scoring, official statistics and league administration services to the league. 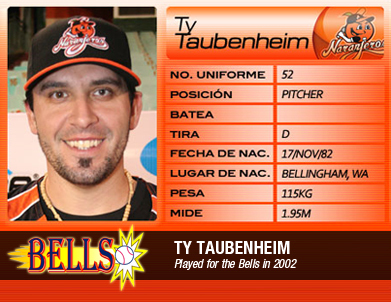 Former Bells pitcher Ty Taubenheim picked up his first victory of the 2009 Winter Season after pitching six strong innings for the Naranjeros de Hermosillo (Hermosilla Orange Growers) of the Mexican Pacific League. 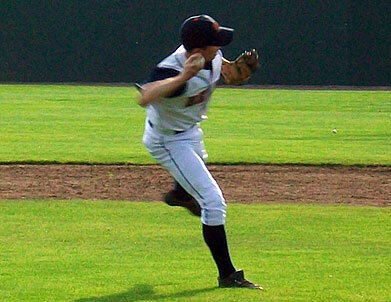 Taubenheim allowed just two runs in his fifth appearance for the club. 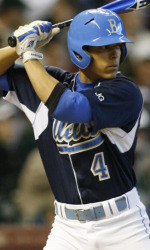 He is one of seven players on the squad who currently hold contracts with Major League affiliates. In its five-year existence, the West Coast League has quickly positioned itself as the best up-and-coming summer college league in the country. It has been efficiently run, especially under the direction of second-year president Ken Wilson (a former major league broadcaster), and its membership not only has vibrant communities that have embraced their teams but there is a growing list of cities throughout the Pacific Northwest that want in. 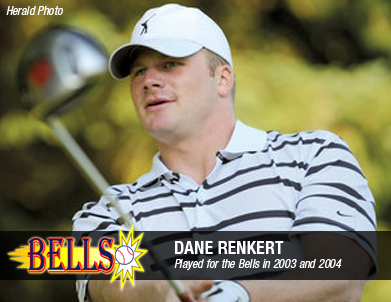 Three months after taking up long-drive golf, former Bellingham Bells pitcher Dane Renkert has qualified for a shot at a world championship and a $250,000 prize. Following two seasons as the pitching coach for the Bellingham Bells, Kevin Matthews has been promoted to head coach the organization announced Tuesday, Sept. 15, after Brandon Newell stepped down to take on a larger scouting role with the Milwaukee Brewers. 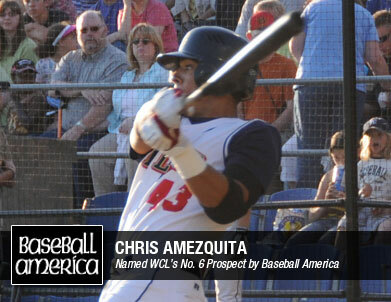 Baseball America has named Bellingham Bells shortstop Chris Amezquita and relief pitcher Seth Harvey the sixth and seventh best prospects in the West Coast League, respectively. 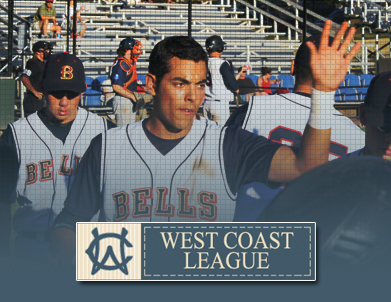 Five members of the 2009 Bellingham Bells earned spots on the All-West Coast League teams announced Monday, Aug. 24, by league president Ken Wilson. Three others were also named as honorable mentions. 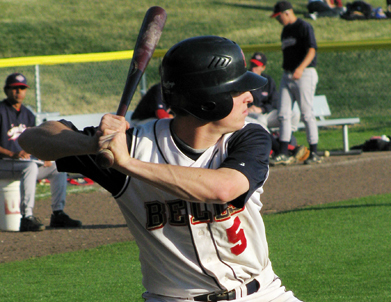 Former Bells player Sean Halton hit his first professional grand slam last week as part of a 9-for-24 (.375) performance with the Helena Brewers. 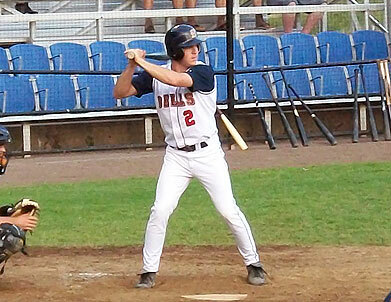 Hanson was 3-for-3 on Monday, Aug. 17, and a 3-for-4 in the first game he played on Friday, Aug. 21. 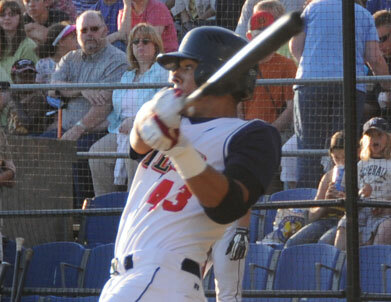 His first hit on Friday put his team up 4-0 as Halton hit his first professional grand slam. He ended the game with 5 RBI, 2 runs scored, a doubled and a home run. 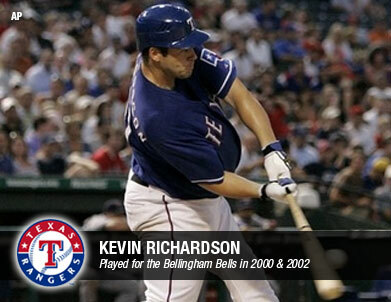 After 557 games in the minors, former Bells backstop Kevin Richardson finally got hit shot on the big stage. Richardson batted eighth in Texas’ lineup Monday in Arlington, Texas, and collected a pair of hits in his Major League debut as the Rangers defeated the Minnesota Twins 8-5. 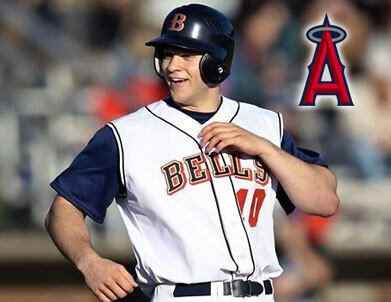 Jake Locker last played baseball when he suited up for the Bellingham Bells in 2008 -- now he’s signed a professional baseball contract with the Los Angeles Angels after the team drafted him for a second time in the June 2009 draft. 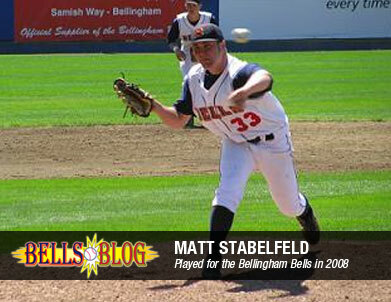 Former Bells pitcher Matt Stabelfeld gave up just one hit in two appearances last week for the Princeton Rays. 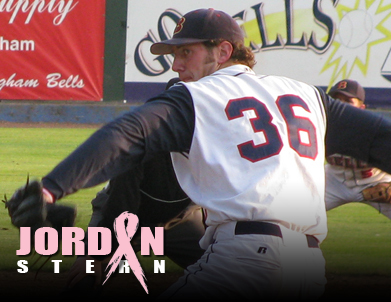 The southpaw pitched two scoreless innings to finish games on Aug. 10 and Aug. 15. 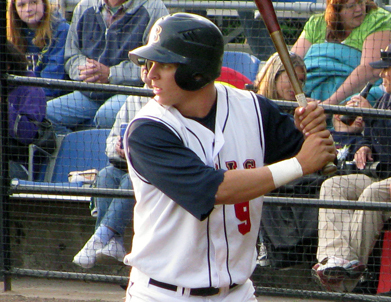 He played for the Bellingham Bells in 2007 out of Lewis-Clark State College. Bellingham’s Taylor Schenk waited until the final home game of the season to collect his first hit in West Coast League action this year. His seventh-inning base knock drove in the Bells’ go-ahead run and gave Bellingham a 4-3 victory over Bend on Thursday at Joe Martin Field. Bellingham had its playoff hopes dashed Wednesday, Aug.5, at Joe Martin Field as the Bend Elks defeated the Bells 15-4 and captured the final spot in the West Coast League’s post season. Bellingham gave up two leads Tuesday, Aug. 4, as Bend overcame one-run and three-run deficits to grab the 8-5, extra-innings win, putting the Bells playoff hopes on life support. With the final fireworks show of the season scheduled for after the game, Ray Hanson and the Bellingham Bells provided some in-game sparks by taking the final game of their nine-game homestand 3-1 over the Kitsap BlueJackets. 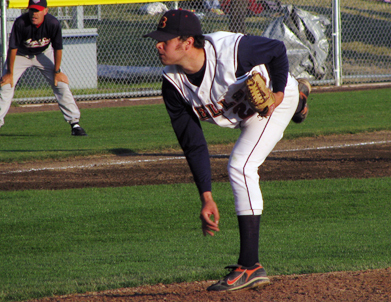 Mitch Ludtke’s relief appearance Friday, July 31, against the Kitsap BlueJackets was nothing short of spectacular as the southpaw retired all eight batters he faced including seven straight strikeouts. Bellingham used a five-run fifth inning to overcome a three-run deficit and snap a 10-game losing streak Thursday, July 30, as the Bells took the series finale 5-4 against the visiting Corvallis Knights. A first-inning Bells error allowed the Corvallis to plate three unearned runs and left Bellingham in a hole it could not climb out of as the Knights took game two 3-2 on Wednesday, July 29, at Joe Martin Field. 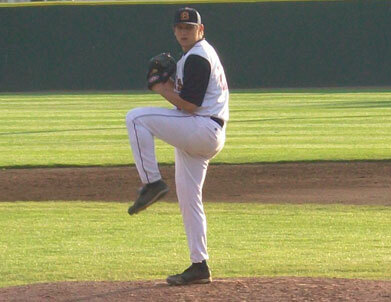 Former Bells pitcher Marc Rzepczynski was back in Washington State on Tuesday, July 28, for a pitching appearance near his old stomping grounds–this time he just happened to be throwing on a slightly larger scale. Bellingham watched its second-inning 4-0 lead disappear Tuesday at Joe Martin Field as the Corvallis Knights extended the Bells’ season-long losing streak to nine games by taking the series opener 8-7. 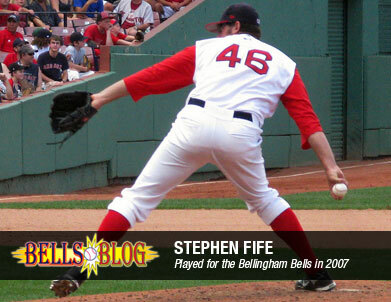 Former Bells pitcher Stephen Fife picked up his first win since being promoted from Low-A Greenville to High-A Salem. Fife gave up one run in his lone start of the week and now has a 1.59 ERA since moving up to Salem. Bellingham suffered two losses in Sunday’s doubleheader against Bend at Joe Martin Field as the Bells’ current losing streak reached eight games. The Bellingham Bells have postponed Saturday’s game against the Bend Elks until Sunday, July 26, due to inclement weather in the Bellingham area. A 13th-inning, run-scoring wild pitch by the Bells gave the Bend a 3-2 victory and sole possession of second place in the West Coast League’s West Division on Friday, July 24, at Joe Martin Field. Bellingham’s woes continued Thursday as the Bells’ losing streak reach a season-high five games. The Bells lost just their second non-league game of the season 1-3 to the Seattle Studs in their return to Joe Martin Field following a six-game road trip. 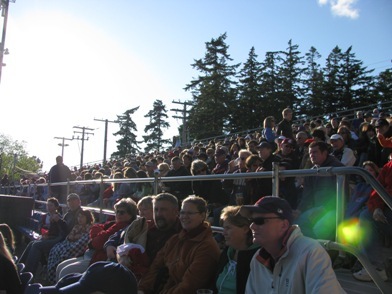 After playing their last 14 West Coast League games on the road, the Bellingham Bells return to Joe Martin Field for an exhibition game Thursday, July 23, before returning to league action at home on Friday, July 24, against the Bend Elks. Kevin Richardson appeared in just two games for the Oklahoma City RedHawks of the Triple-A Pacific Coast League last week, but turned in a two-home run performance on Thursday, July 16, to earn my Bells Blog former player of the week award. Bellingham won two of its three games in Bend to take sole possession of second place in the West Coast League's West Division. The Bells opened the road series with 4-3 victory on Friday and took the second game 12-10 before falling 4-5 in the Sunday finale. 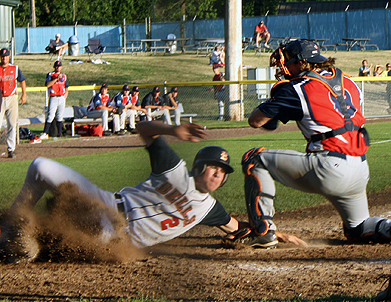 The Bellingham Bells held the upper hand Thursday against Bellingham Post 7 at Joe Martin Field. After jumping out to an early lead, the Bells held off the pesky Post 7 squad to capture an 10-6 victory—the Bells’ eighth straight at home. Bellingham recovered from a leadoff home run by Portland to win its second straight against the Ports, 6-4, Wednesday afternoon at Joe Martin Field. Summer Ball is an independent blog that tracks college baseball and summer ball leagues throughout the year. 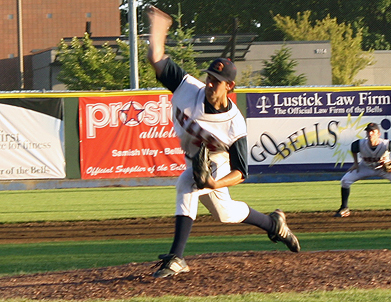 Recently, the blog recognized Bellingham's Tyrell Poggemeyer as its West Coast League pitcher of the night for his performance against the Kitsap BlueJackets on July 3. Poggemeyer tossed a complete game shut out and allowed just six hits while striking out a pair. The win moved Poggemeyer to 2-0 on the season. Former Bells pitcher Braden Tullis made is first professional start on Saturday, July 4, striking out nine batters in 5 innings of work. 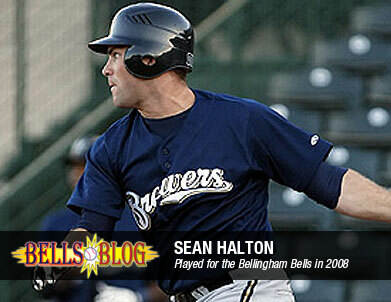 His performance in his first start has earned him my Bells Blog former player of the week award. Craig Hertler broke up a scoreless ball game in the seventh with an RBI single and Bells starter Tyrell Poggemeyer went the distance, keeping Kitsap off the board to give Bellingham its fourth straight West Coast League victory, 2-0. Facing one of the league’s top pitchers, Bellingham came from behind for the third time in as many nights to sweep Kelowna and even its record at nine wins and nine losses. 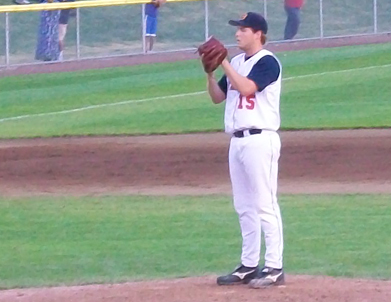 In his first appearance at Joe Martin Field, right-handed pitcher J.D. 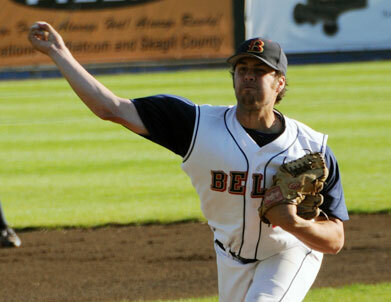 Haver gave Bellingham six strong innings to pace the Bells to a series-clinching 4-1 victory over Kelowna. Bellingham used a season-high 14 hits and six Kelowna errors to score at least one run in every inning but the third en route to a 9-4 series-opening victory over the Falcons on Tuesday, June 30, at Joe Martin Field. 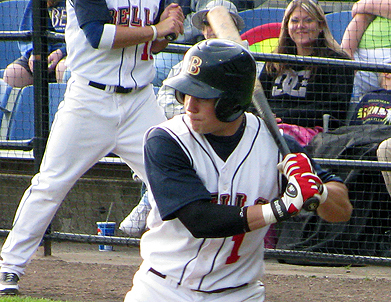 Mike Chiarelli technically led the Oregon State Beavers in 2009 with his .500 batting average. So maybe it’s no surprise that he now finds his name atop the West Coast League leader board after batting .462 (18-of-39) through Bellingham’s first 17 games. Friday brings the homestand to a conclusion as the Bells welcome the Kitsap BlueJackets to town for one game at Joe Martin Field. 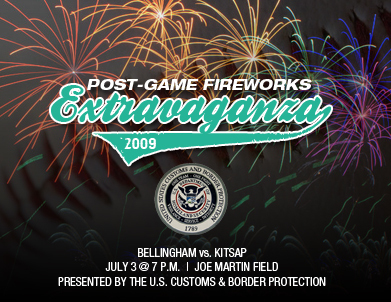 Bellingham is sure to end its homestand with a bang as U.S. Customs and Border Protection is sponsoring activities throughout the game and post-game fireworks. Come out early to enjoy all the excitement around the ballpark and enjoy an early Independence Day celebration with the Bells. Gates will open at 6 p.m. with the first pitch schedule for 7 p.m.
Bellingham will look to clinch a series victory as they return to Joe Martin Field for game two of a current three-game set against the Kelowna Falcons. 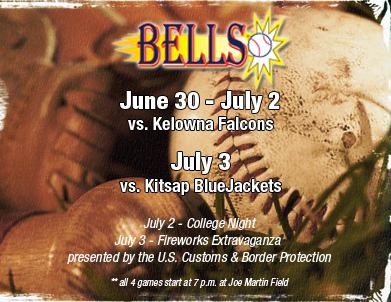 The Bells also host home games Thursday (College Night) and Friday (Post-Game Fireworks presented by U.S. Customs & Border Protection) at The Joe. 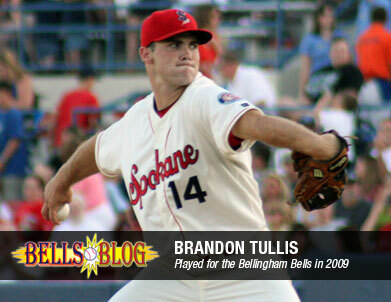 Each Monday the Bells Blog on BellinghamHerald.com takes a look at former Bellingham Bells players now playing professional baseball. 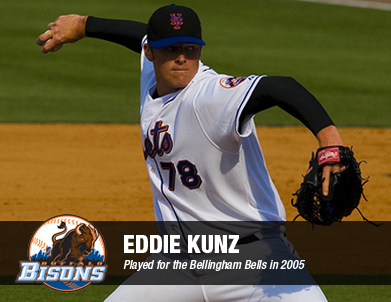 Currently there are nine former Bells playing in the pros including 2005 Bells reliever Eddie Kunz (pictured) who is the only Bells player in the West Coast League era to reach the Majors. 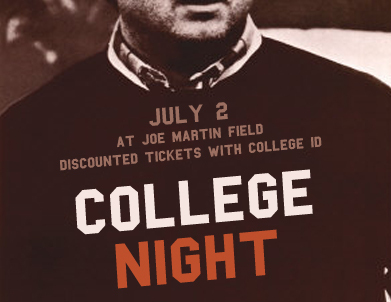 Thursday is College Night at Joe Martin Field and students are invited to come enjoy all the excitement at a discounted price. Come out and join the Bells as they host the Kelowna Falcons in the series finale beginning at 7 p.m. Show your college ID at the Bells Ticket Window and receive a special discounted ticket price. Bellingham’s Ray Hanson and Mitch Ludtke combined on a four-hit shutout Sunday, June 28, in an exhibition game against the Everett Merchants. 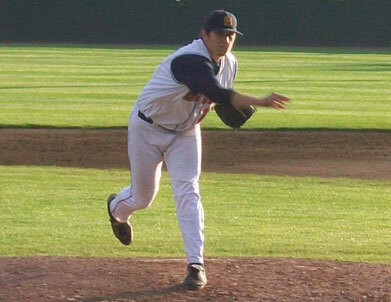 Hanson, appearing in his first game since the Bells last faced the Merchants on June 11, pitched five innings and struck out two before being put in line for the win on a Tanner Leighton single that drove in Danny Hennigs for the game’s first run in the home half of the fifth. Tied at five in the 12th inning, Wenatchee capitalized on back-to-back leadoff walks to capture a 6-5 victory – its second one-run win in as many nights. BELLINGHAM, Wash. – Sometime the bounce goes in your favor – sometime it just pops over your head. 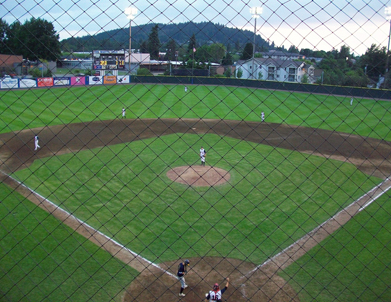 Friday, the ball took a bad bounce off the infield at Joe Martin Field and over the head of Bellingham (6-8) second baseman Craig Hertler to put the eventual game-winning run on first base as the Wenatchee AppleSox (11-3) won a speedy pitchers’ dual, 1-0. 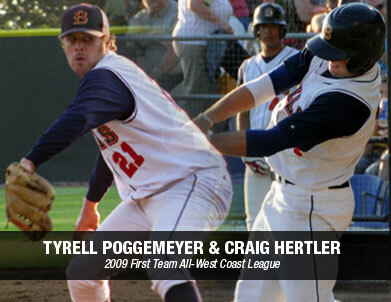 Tyrell Poggemeyer threw eight scoreless innings in the one hour and 54-minute contest, but after striking out six and allowing just five hits, he stayed in the dugout for the ninth inning and could only watch as a pair of teammates allowed the game’s only run in the top of the ninth before Wenatchee starter Chad Wagner returned to the mound to complete his nine-inning gem. Poggemeyer looked sharp as he was able to command his off-speed pitches and mix in his fastball with ease. He even retired the side five times, but it came with a little assistance from an outstanding defensive performance. Kevin Whitehead picked off Tommy Reyes at first base in the fourth and then caught D.J. 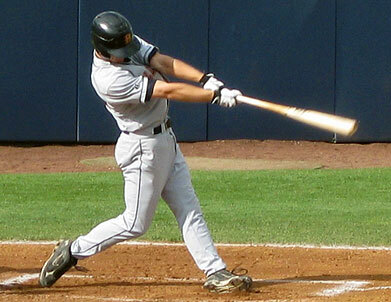 Crumlich trying to steal home on a failed squeeze bunt attempt. In the sixth inning the Bells threw out Josh Takayoshi at third as he tried to turn a double into a triple, and Poggemeyer even helped his own cause by picking off a runner in the seventh. Offensively, however, the Bells' bats went seemingly unnoticed until the last inning. Bellingham scattered just two hits through the first eight innings and Wagner faced the minimum from the end of the second until Patrick Claussen hit a one-out single in the seventh. “We executed well tonight defensively and that’s an area where we’ve struggled so far this season,” Newell said. “But the games in this league are generally decided by one or two runs and we just couldn’t get it done when we needed to. Wenatchee used three straight singles in the ninth off of reliever Jordan Stern, including the tough-luck, bad-bounce single by Reyes, to set up a tough situation for the Bells. Stern quickly struck out the next two batters, much to the delight of the 783 in attendance, before a battle of inches ultimately resulted in a five-pitch walk to Kevin Komstadius and plating the game’s only run. Brandon Foster came in following the walk to get the final out of the inning. Bellingham also loaded the based in the ninth with one out, but Wagner got Chris Amezquita to ground into a double play to keep the Bells off the board and capture his second win of the season. Bellingham and Wenatchee meet Saturday, June 27, in the rubber match of the current three-game series. 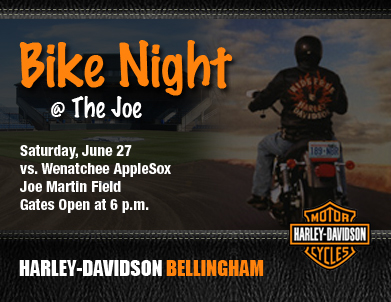 First pitch is schedule for 7 p.m.
Saturday is Bike Night at Joe Martin Field presented by Bellingham Harley Davidson. Fans riding their motorcycles to the game will receive a discount on their tickets a reserved parking spot to show their bike off to other fans in attendance. For the Bellingham Bells and starter Luke Scott it was good to be home after dropping four games during their last six-game road trip. Despite falling behind early to the Wenatchee AppleSox, the Bells bounced back with a four-run fourth inning to earn the 6-3 win and snap a three-game losing streak. 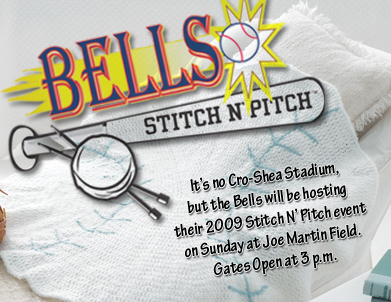 The finale for the weekend is Sunday, July 28, at 4 p.m. when the Bells host the Everett Merchants in exhibition action as part of their 2009 Stitch N' Pitch event. Saturday night at 7 p.m. will be the series finale of a three-game set against the Wenatchee AppleSox. Saturday is Bike Night at Joe Martin Field. The event is being presented by Bellingham Harley Davidson. Fans are invited to ride thier motorcylces to the game and receive $1 off their ticket prices and a V.I.P. parking spot. Tickets are available at the Bells Ticket Window located just outside Joe Martin Field. 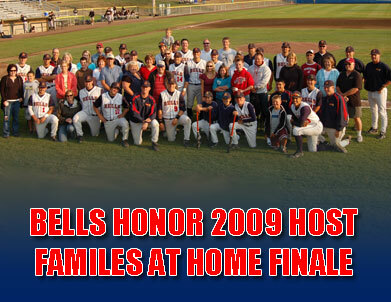 Fans can also pre-order tickets by calling the Bells Ticket Office at (360) 527-1035. 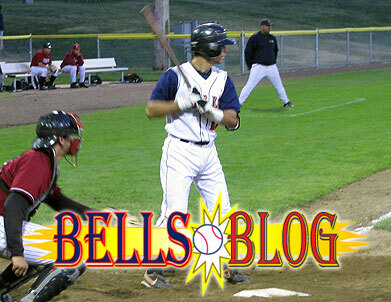 Bells put together four runs on three hits in the top of the ninth to win against Bend 7-5. Bellingham is shut out in the second game of the series against Bend. Bend, OR. 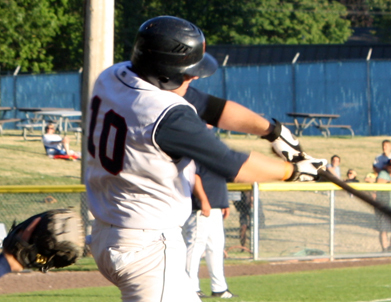 – The Bellingham Bells won their first road game of the season 9-5 against the Bend Elks last night. The Bells got off to an early lead putting up four runs in the top of the first inning against Elks starter Jordan Remer. 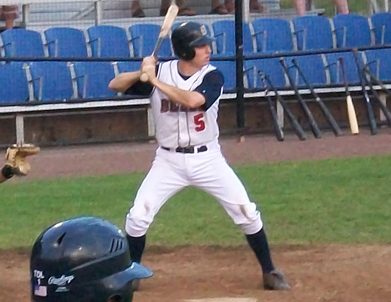 Centerfielder Mark Purser singled into left field with the bases loaded to bring home catcher Mike Chiarelli and third baseman Chris Amezquita for two of his three RBI’s. Bend made it interesting throughout the game as they scored two runs on a couple of wild pitches by Bells pitcher Luke Scott in the bottom of the second and a Cal Towey single in the bottom of the fourth, making it 4-3 Bells. The top of the eighth proved to be game changing when the Chiarelli got the Bells bats going once again with a double to left center. Purser singled in Chiarelli after he advanced to third on a Beau Brett groundout. 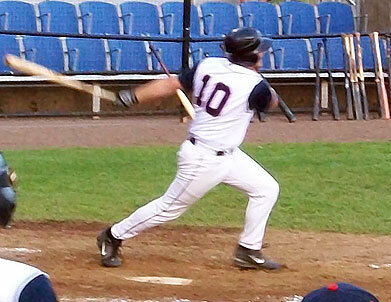 Brady Locker was hit by a pitch and put two on for Sam Richter to clear the bases with a two-run double. After a Hertler groundout, Patrick Claussen singled to left scoring Richter. The Bells scored four runs in the inning taking a 9-3 lead into the bottom of the eighth giving them enough to win the game. Pitcher Luke Scott went seven strong innings for the Bells allowing three runs on six hits while striking out two and walking four. The Bells gear up for another game against Bend at 12:30pm this afternoon. To tune into the Bells game, log on to kpov.org. The Bellingham Bells used a four-run seventh inning to grab the lead en route to a 5-3 victory over Corvallis on Sunday at Joe Martin Field. 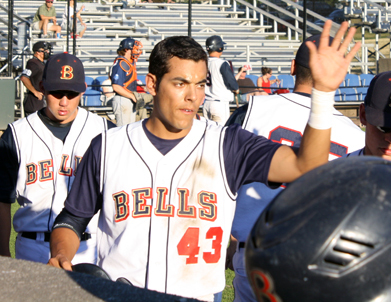 The win gave the Bells their first back-to-back wins and first series victory of the season. 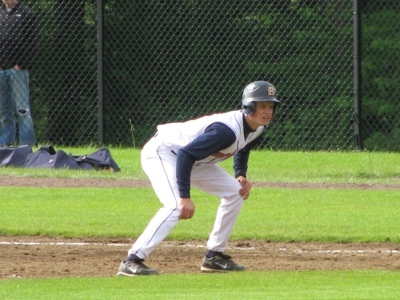 Most of Saturday’s game was a dual on the mound between Bellingham and Corvallis, but the game was ultimately won with a squeeze bunt in the bottom of the ninth as the Bells’ Mike Chiarelli drove in the pinch-running Garrett DeRooy to give Bellingham the 2-1 victory. 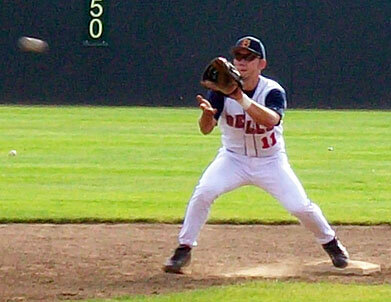 Entering the ninth inning, the game was tied at eight and Bellingham had a 12-11 advantage in the hits column. But the Knights benefited from two walks by reliever Seth Harvey and Pat Cowell drove in his first run of the season to put Corvallis on top for good. 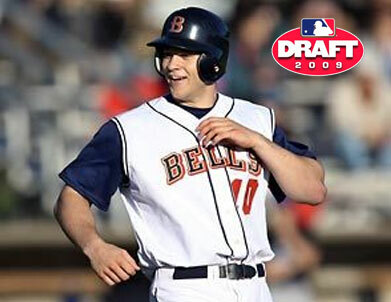 Day two of Major League Baseball’s 2009 First Year Draft featured some familiar names for Bellingham Bells fans. 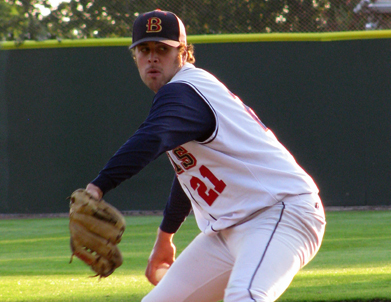 Right-handed pitcher Braden Tullis was selected in the eighth round (244th overall) Wednesday by the Texas Rangers and was the first of four players taken off the board with ties to the Bells. 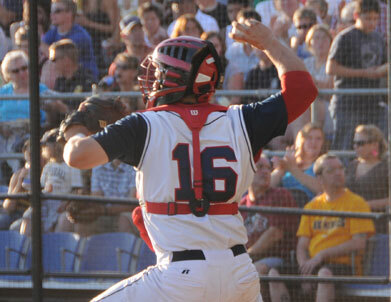 Bellingham continued its homestand Thursday with an exhibition contest against the Everett Merchants at Joe Martin Field. The Bells and Merchants were knotted at three after three innings, but the visiting Merchants added four in the fourth and never looked back on their way to a 9-4 victory. 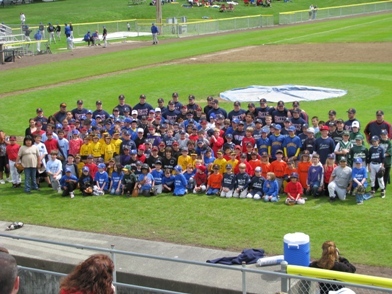 Bells Baseball Camps will be held June 29th - July 1st and July 27th - 29th! Patrick Claussen collected two of Bellingham’s four hits Sunday afternoon, but his productivity was overshadowed by a quartet of Kitsap pitchers who combined to keep Bellingham off the board en route to a 6-0, series-finale victory at Joe Martin Field. Bellingham suffered its first loss of the season Saturday as the Kitsap BlueJackets bested the Bells 5-3 in the second game of a three-game series at Joe Martin Field. Bells bats blow up in Opening Night win! The Bells started off the season on the right foot with a 9-1 victory over the Kitsap BlueJackets. 2009 Individual Game Tickets on Sale Now!!! Bellingham Bells individual game tickets will be going on sale Wednesday May 27th, at 9 a.m. Tickets can be purchased by phone at (360) 527-1035 or stopping by the Bells office located at 1732 Iowa St.